So you need a drink, and you are stuck in the urban jungle called NYC. Contrary to belief, city water nowadays is quite safe and clean to drink. What you smell and taste are trace minerals in pipes. It won’t kill you but the stigma is damning. 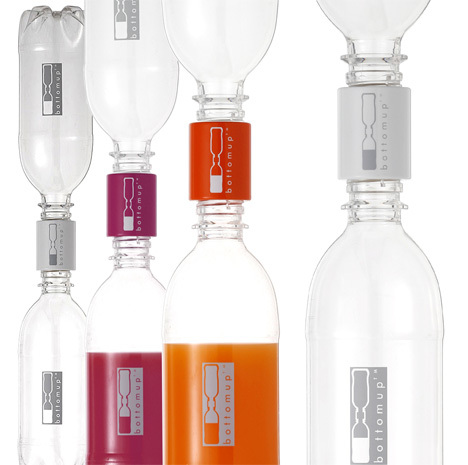 The BottomsUp concept is a portable water purifier. You fill any PET type bottle with water, screw on the top and like Brita (or Pur), what comes out is a whole lot better tasting. Now this is just a concept but everyone from kids to the elderly will own one if it really works. It seems to be better then spend a couple dollars on bottled water. Big things come in small packages, and the Safe Turn Indicator Light is one of those packages. Here in the states it is getting harder and harder to find safe places to ride your bike, the roadways are getting packed with motorist that don't want to share the road, in a hurry, and truly don't understand why we ride bikes. The Indicator promotes safe cycling. Making it easier for people who commute or are training, this product is great. Wow, you can think of all the fun things you can do with Snow Kiting, but the best is how easy it is for people living far from the Mountain on semi open land. Here is a video of the kites in action. Snow Kiting is the latest winter sport. Large highly controllable foil kites are used to blast kite pilots along with just the power of the wind! The 'Big air' jumps that boarders and skiers are pulling under the power and security of power kites are simply breath taking. Snow Kiting is a lot easier to learn than kiteboarding on the water! It is easy to stand on snow, which makes the whole process easier! The whole learning experience is lot less daunting as you need much less power and wind to get you moving. Finally, holding an edge in snow is much easier than in water making up wind progress much easier to master. All you need is snow and a power kite and you can turn a cold winter's day into a blistering, adrenaline soaked experience! To Snow Kite you will want a foil type kite since it is completely soft in structure and cannot be damaged easily when the kite is slammed into the ground. Foils are also capable of reverse launching which is very important for re-launching these kites from the snow. Check it out, Snow Kiting. Now Polar has a great bunch of watches and their newest RS800 is not lacking much, since does not have the GPS built in you have to attach somewhere on your body along with the foot pod for running stride and distance. A bit of a pain consider the Forerunner 405 has it built in. Goods and bad to all this technology is that the Forerunner has a built in GPS, but like the Polar you need the foot pod. Mostly for the things mentioned above but if you don't like the weather outside and you want to record your workout, you need the foot pod for the treadmill. Sorry not everything can be in one neat package. Cost is $300 with out the foot pod. Loaded with serious training features, Forerunner 405 continuously monitors your time, distance, pace, calories and heart rate (when paired with heart rate monitor). Each run is stored in memory so you can review and analyze the data to see how you've improved. You can even download recorded courses to compete against previous workouts or race a Virtual Partner®. Customize Forerunner’s data screens for instant feedback while you train. Once you’ve logged the miles, innovative ANT+Sport™ wireless technology automatically transfers data to your computer when the Forerunner is in range. No cables, no hookups. The data’s just there, ready for you to analyze, categorize and share through our online community, Garmin Connect or our optional Garmin Training Center® software. You can wirelessly send workouts from your computer to Forerunner, too. With Forerunner 405 you can share your locations, advanced workouts and courses wirelessly with other Forerunner 405 users. Now you can send your favorite workout to your buddy to try, or compete against a friend's recorded course. Sharing data is easy. Just select “transfer” to send your information to nearby units. Forerunner 405 sports a unique design that gives the GPS antenna a better view of the sky, so it can get a stronger signal during your run. And its high-sensitivity GPS receiver provides improved tracking under trees and near tall buildings." Technology is defined different to many different people, here at TubaDuba, it is anything that helps athletes/fitness buff get better. So when you see women wearing skirts at the gym, well this is something very new. For biking it is not so new Athelta has been overing one for a while. Seeing women in the gym wearing a skirt is well, nice. You have seen for years now the USTA wearing skirts, tiny but skirts none the less, so why has it taken so long to hit the gyms, not sure. "The TRIKS wardrobe staple, this skirt with built-in shorties is everything you’ve ever asked for. Name it…the GymGirl can do it! Made for running, from the local 5k to 26.2, the GymGirl pulls out all the stops. Lightweight, luxurious SpeedSilk fabric gently flows across your thighs while the TRIKSmesh built-in shorties with a 3.5 inch inseam provide modesty and booty-enhancing subtle compression. Yes, the shorties actually enhance your womanly curves. Side slits allow for a little extra freedom without showing it all! We love pockets. Why? Because we’re women and we’re prepared for anything. Two pockets, one on the side of each leg can hold gels, keys, money, ID, dog treats, you name it! Best of all, the pockets will fit a small music player for those of us who need a little musical-inspiration on the trails. Simply thread your cord through the little buttonhole under the waistband and tune out discreetly (yes, we thought of everything!). Warning: Wearing the GymGirl will lead to a reputation as the fashion maven of your universe. Be prepared for increased popularity!" All the technology and innovations can't keep a good kid down. Building Igloos is one of the best winter time activities that one can do, and it last (as long as it is cold) for a long time, weeks. 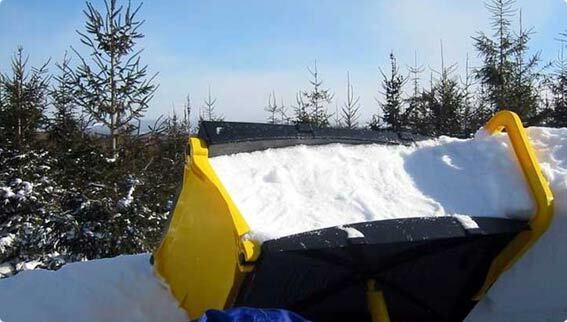 Well Grand Shelters has come up with a sure fire, long lasting helping solution to building a snow shelter. It seems great, the only draw back is the price, yes it is reusable but $179.95 is a bit steep for those of us just wanting to play, hey maybe they will send me one to try out, you never know. "Three years in the making, Helly Hansen introduces the Odin Project, a technically advanced apparel system designed to provide the absolute best weather protection, comfort and durability from base layers to outerwear for professional mountain guides, patrollers, climbers and expeditioners who spend months at a time in rugged back country conditions. The collection combines Helly Hansen’s 130 years of experience in the work wear industry with the most advanced performance fabric technologies and latest sport-inspired designs. No details were overlooked or left untested – from pocket placements to welded seams – in the development of the series available at an exclusive number of leading outdoor and mountaineering specialty stores in 2008." The collections consists of a Mountain Jacket, Mountain Pant, PCM Soft Shell, Isolator Jacket and the vest. What a great collection for those who can afford or work for a company that has this as there wardrobe. It's all changing and going fast, iPhone, Garmin 404, Polar have come a long way in the past couple years, incorporating where you've been to where you want to go seems to be the biggest push to small screens. You have the Personnel Fitness Records (you read it here first), which slowly is making a faster acceptance than the EHR or PHR (personal/electronic health record) and with Nike+ working with Apple /iPhone or related device could be the next frontier in having doctors seeing this as an acceptable format in looking at your records. It would be interesting to see companies like Life Record EMR to work with companies like Health Currency, Polar or Google Health to get a complete EHR picture of a patient. The Best of all it would be stored in one device and permission could be dolled out to whom ever you wish. Check out CES and get ready for an explosion of cool products in the next week. It looks like Mountain Hardwear is off to it's lightest start to the new year yet. They have released a jacket that is rain-repelling and weighing in at 6 oz., yes 6 OUNCES, the closest one is 11 oz. How have they done it, buy applying a thin polyurethane coating to a new strong material that resembles pantyhose. It has a four way stretch, fully welded, waterproof and breathable.